This pump is ideal for watercooling of PC systems and other electronic components. The small dimensions and great performance also allow use in even more applications. 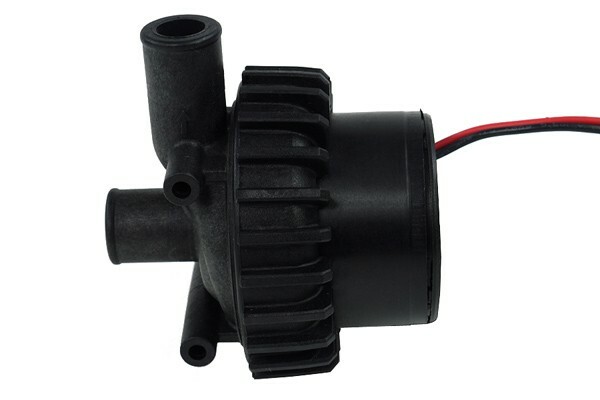 This DC pump is an electronically commutated ball motor pump with a spherically shaped rotor unit, allowing running times of more than 50.000hrs at 12V. The only moving part in this pump is a spherically shaped rotor unit which is sitting on an ultra-hard ceramics bearing ball. A conventional shaft with bearings and gaskets is not needed! The spherical bearing prevents potential development of bearing play, hence ensuring quiet and smooth running operation throughout the whole lifespan. The bearing is directly lubricated (wet running) by the coolant. Maintenance is hence obsolete. The rotor is always kept in position magnetically, hence small particles are not an issue. Blocking of the pump is not possible under normal circumstances. Even after longer stand-still periods a safe spin-up is ensured. The permanently magnetic rotor unit is driven by the magnetic field from the surrounding stator. The stator is completely surrounded by the stator, hence making the pump only 38mm high, barely more than the stator itself. It hence easily fits in all common PC-, Barebone- and Mini-PC cases. A separate magnetic shielding is usually not required. The ball motor principle allows power-saving operation with comparatively high performance. By varying the input voltage the DDC pump can be adjusted over a wide speed range. All materials in contact with the coolant are corrosion resistant. This pump has 5 settings accessible via a switch. It can be adjusted from 1800 to 4800rpm. Please note: The power connector of the pump is not equipped with a plug. We hence recommend to order Item number 82021 with his pump. The image gallery shows the pin configuration.